I love to cre ate memes myself. You’ll see a few among my posts/pages. However there are SO many out there I find inspiring and insightful. I love to save them and share them. I love to reread and ponder. This one is particularly fresh to me at the present moment. I have typically lead my life to in such a fashion, but there are times where ‘stuff’ encroaches into your dome of peace and sets things off kilter a bit. Those moments feel off-setting and can often set you into a tail spin of negative feelings. It’s good to remind oneself that the outside negativity is not your own. 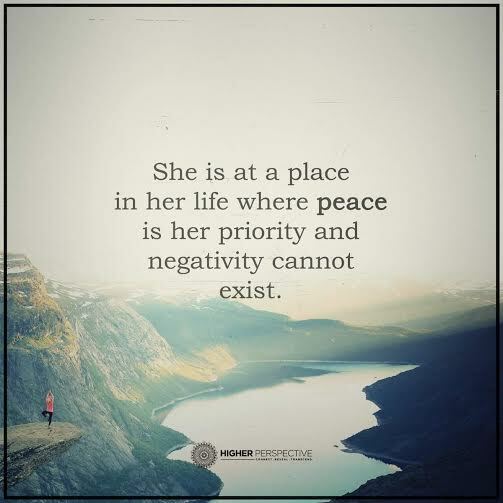 When people or things or circumstance over-step their boundaries, it’s ok to take that few steps back and regain your inner/outer peace once again. Boundaries can be good and ever-so-healthy. I don’t know if there is a time when we finally master this, or if we need the challenges to become stronger in mastering this process. Either way, I am always grateful for peace’s return.